Everyone, except me, seems to be baking their own bread at the moment. The truth is, I don't have an affinity with yeast. Believe me I've tried but every time I can still detect that yeasty aroma which really shouldn't be there in the finished loaf. Then there's the sourdough starter, treasured, coddled and cooed over. Don't get me wrong I love sourdough breads and I've even cultivated my own 'starter' in the past. It squatted in the kitchen, barely contained by a glass jar; needy and attention-seeking. A three week forced separation put an end to the relationship. A deflated, grey residue was the only reminder of a past love affair. Reader, I binned it. So what could change my mind about home bread-making? Well an offer to learn about slow fermentation from one of the best bread makers in London could be just what I need. While I'm firming up on that interesting prospect, here's what I make when I do need to produce a loaf myself. Not that this is second rate. Soda bread always goes down well in our household. Unlike a good sourdough, it doesn't keep beyond a couple of days but it's gorgeous toasted on day two. The rise is achieved by the action of bicarbonate of soda on the acidic buttermilk, so no chance of a yeasty overtone. True buttermilk is leftover from the butter-making process. These days it's generally only available from farms and dairies. What you can buy in supermarkets is usually 'cultured' buttermilk. Thicker than true buttermilk, it is pasteurised skimmed milk (or powder) to which a culture is added to sour it. It works in soda bread but, obviously, if you can get the real stuff you'll get a better result. In London you can buy true buttermilk from Neal's Yard Dairy. This recipe for soda bread is adapted from one made by Irish chef, Richard Corrigan. It appears in his book 'The Clatter of Forks and Spoons'. 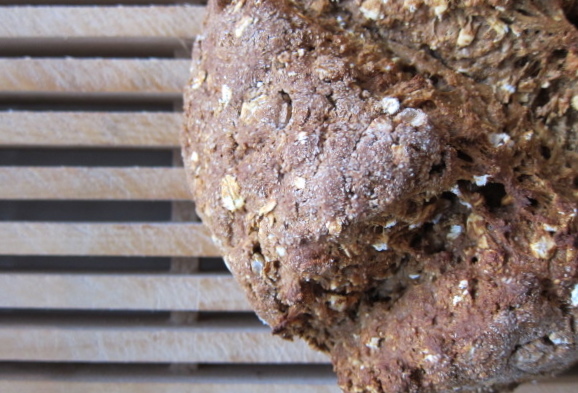 Corrigan's cooking comes straight from his Irish roots and this recipe makes my favourite soda bread. I vary the mix of plain and wholemeal flours sometimes to achieve a lighter or darker loaf depending on what I'm planning to eat it with. Preheat the oven to 200C (180C fan oven). Line a baking sheet with baking parchment. Mix all dry ingredients in a large bowl. Make a well and add to it the buttermilk, honey and treacle. With a wooden spoon, gradually mix the dry ingredients into the wet until you have a loose, wet dough. Turn it out onto a lightly floured surface, knead lightly just enough to be able to bring the dough into a round. Place on the lined baking sheet. Using a sharp knife, slash a cross in the top of the dough. Bake for about 45 minutes. The bread should sound hollow when tapped on its base. Place the bread on a wire rack to cool covered with a damp cloth. The cloth will soften the crust and keep the bread well for a couple of days. In 2013 I will try to form a new relationship with a 'starter'. Until then, this soda bread will do me nicely when I can't pick up a favourite sourdough loaf.